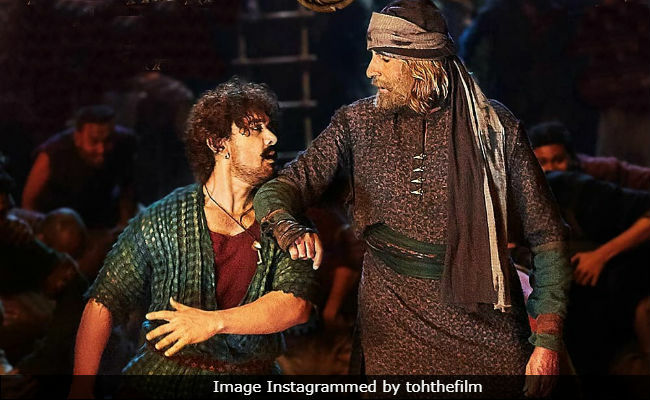 Amitabh Bachchan and Aamir Khan's big Diwali release Thugs Of Hindostan might have not impressed the critics, but the cine-goers have made the film a blockbuster at the theatres. In just a day, Thugs Of Hindostan earned over Rs 50 crore and with this, it now stands on #1 on the list of top five opening day business of films in 2018. Ranbir Kapoor's Sanju previously headlined the list. Trade analyst Taran Adarsh reports that Thugs Of Hindostan collected Rs 50.75 crore and adding the business of its Tamil and Telugu releases, the current total comes to Rs 52.25 crore. (Whoa!). "Thugs Of Hindostan smashes all records (Hindi films) as it breaches Rs 50 crore on Day 1. Sets new benchmarks in some circuits. Big holiday (Diwali) + tremendous hype + massive screen count help put up a sensational total," tweeted Mr Adarsh. Here's the box office report of Thugs Of Hindostan. Thugs Of Hindostan's earning is so far the highest for any Diwali release, for any Yash Raj Film and also for a Hindi film. H-I-S-T-O-R-I-C *Day 1 biz* was expected, but the real test for #ThugsOfHindostan begins from *today onwards*... Will have to maintain the pace over the weekend [Fri to Sun] and *also on weekdays* to put up a MASSIVE TOTAL... Wait and watch situation right now! Thugs Of Hindostan, also starring Katrina Kaif and Fatima Sana Shaikh, released to poor reviews. In his review for NDTV, film critic Saibal Chatterjee gave Thugs Of Hindostan 2.5 stars out of 5. "Big, bloated, bombastic, Thugs Of Hindostan is a period saga that banks solely upon action and spectacle for impact. It might entertain large swathes of the audience, but it is ultimately too tacky and unconvincing to lay legitimate claims to being India's answer to Pirates of the Caribbean. It isn't even a poor copy," he wrote. Amitabh Bachchan and Aamir Khan's Thugs Of Hindostan is directed by Vijay Krishna Acharya.